Okay, so. I mentioned that I'm a HUGE fan of Autumn, right? Okay, let's get real. You guys totally know me. So why do I even find it necessary to ask this question? I think it's pretty safe to say that I've totally made my love known for all things Autumn. Am I right? And shades of orange and ivory? Such a perfect palette if you ask me! Because nothing makes me happier than when I start to feel a little chill in the air. Anyone else? For me, it's just the coziest of seasons. It's a time for using warm and vibrant color. And of course I'm being biased here... but I just have to add that it is one of the prettiest times to say ''I do.'' Festive, fun and all kinds of fabulous...these are the sort of colors that Autumn lovers (like me) adore! Anyone else feeling like breaking out the boots and scarves yet? Or is it just me? 15 Comments " Party Palette | Harvest Hues! " I love that we were both feeling "orange" today! Beautiful fall palette! How I adore fall–and this perfect palette! I'm right there with you - I adore autumn! Love to do the boot and scarf bit but we're having a heat wave here. Love those rustic colors! Absolutely love these colors! Fall colors have really grown on me in recent years. They're so warm and welcoming, and cozy! I can't believe summer is over! Can we all have a reset button please? The only thing that makes it better are fall color palettes - and this one is amazing! I love the orange colors of fall. Such a great inspiration board - the invitation suite is beautiful. My favorite time of the year has always been when the leaves change colors in the autumn. I love these autumn colors. 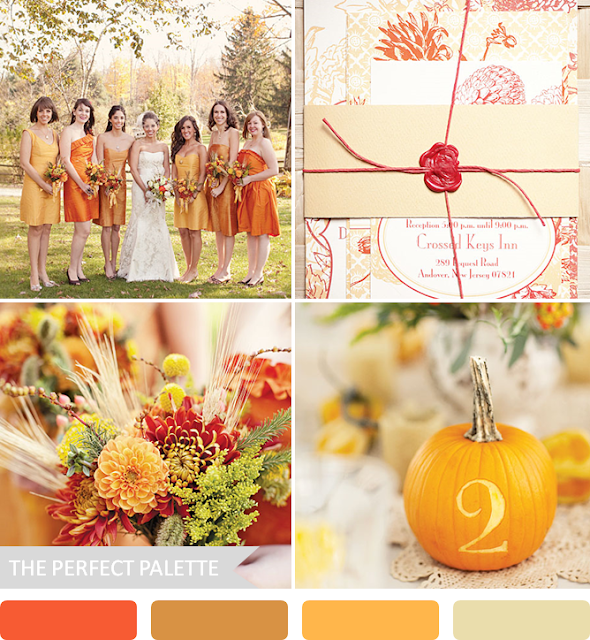 I definitely want to use the palette of autumn colors for my upcoming wedding. The only problem I have is that my bridesmaids are in different states and I want all of their bridesmaids’ dresses to match. So should I use an online bridal shop like www.bridesmaids.com or just have them try and find a dress in their local area?